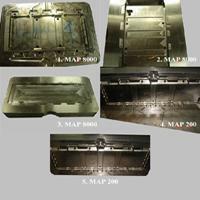 Mold - Mcm Stamping Co., Ltd. The auto mold plays an important role to automobile industry. With the use of quality auto mold, the metal parts can help you to boost the quality on your automobile. There are ample accessory to be applied in every vehicle, such as bumper mold, stand column mold or crate mould, and it is imporant to have quality auto molds to stable your vehicles. We have years of experiences and fine machinery to support and satisfy your demands. OEM service is available at MCM, please do not hesitate and contact us for more!